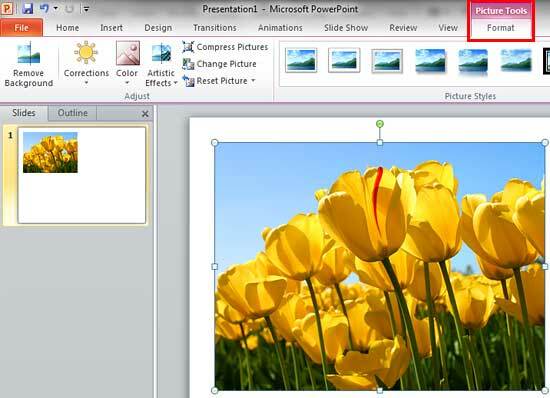 Open your presentation, navigate to any slide that has a picture inserted. Just select or double-click the picture to activate the Picture Tools Format tab of the Ribbon, as shown in Figure 1 (highlighted in red). Within the Picture Tools Format tab, locate the Adjust group -- here you will find several options that let you adjust your pictures. Click the Corrections button (highlighted in red within Figure 2) to access the Corrections drop-down gallery that you can see in Figure 2. 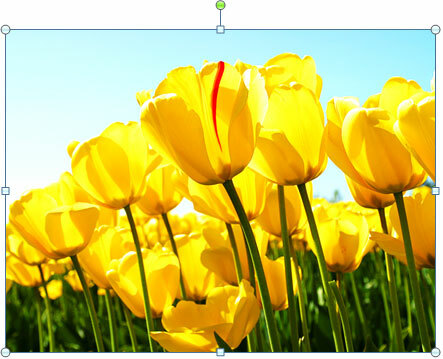 Sharpen and Soften: Displays previews with various sharpness and softness values. The thumbnail in the middle (highlighted in yellow) represents the current status of the picture. Brightness and Contrast: Displays previews with various brightness and contrast values. Again, the thumbnail in the middle (highlighted in yellow) represents the current status of the picture. If you hover the mouse cursor over any of the picture variants within the Corrections drop-down gallery, you will see a tool tip as you can see in Figure 3, which displays the adjustment values of the particular variant. Also, as you move over different previews, the selected picture shows you a live preview of the variation being selected within the Corrections drop-down gallery. Click on any of the variants to apply its correction values to the selected picture. At this point, if you are happy with the effect, you can continue with it. 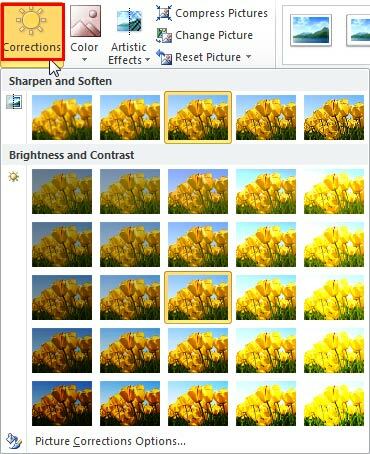 Otherwise, if you want to fine-tune the effect further, open the Corrections drop-down gallery once again, and select the Picture Corrections Options (highlighted in red within Figure 3 above), to summon the Format Picture dialog box. 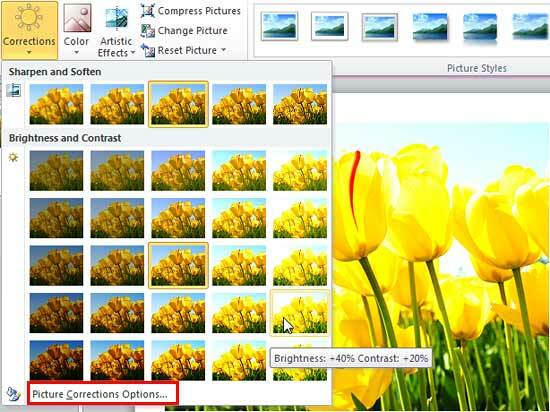 In this dialog box, make sure that the Picture Corrections option is selected in the sidebar as you can see in Figure 4. Now, make changes to the Brightness, Contrast, Soften, and Sharpness values as required. You can either use the sliders or directly type in the values in digits, as required. Once you have fine-tuned the effect using the options within the Format Picture dialog box, click Close button to apply the changes and get back to the slide. Figure 5 shows the selected picture with changed brightness and contrast values. Compare Figures 1 and 5 to see the difference. 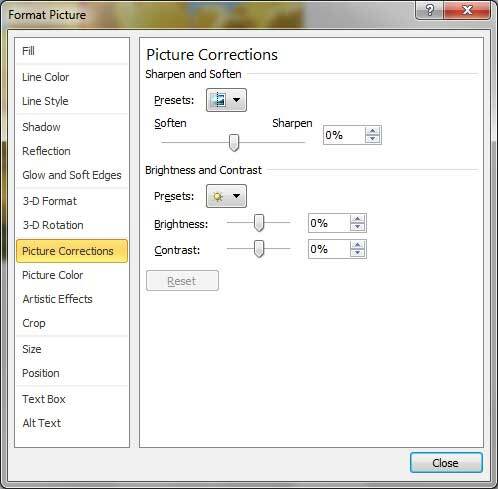 Tip: You can follow the same procedure explained above to make corrections to pictures used as a fill for shapes.